In a medium bowl, combine the crab meat, parsley, lemon juice, and garlic. Season with salt to taste, and bam. You've got crab stuffing. Cut a slit down the middle of each fillet. You don't want to go all the way through, maybe leave anywhere between 1/4 to 1/2 inch on the bottom. Place about 1/2 cup of the stuffing in the slit (and on top of the salmon). Place the salmon on a baking sheet and bake for about 18-20 minutes, or until at your desired doneness. 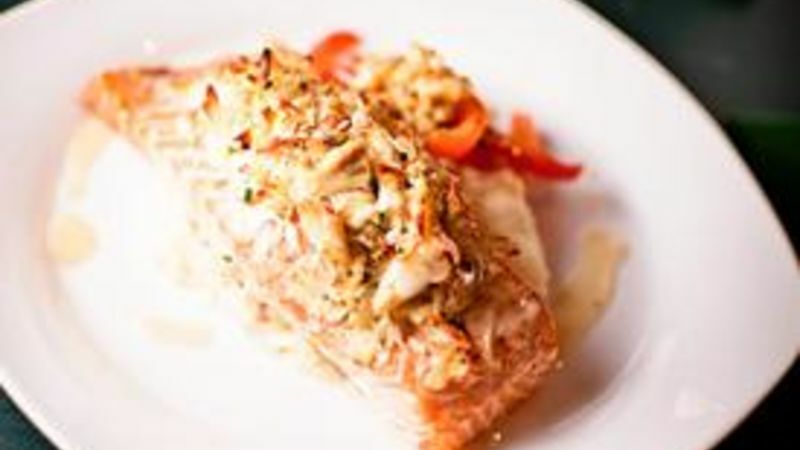 When you stuff a beautiful salmon filet with even more delicious seafood, you can expect nothing but greatness. Clearly this stuffed salmon recipe isn’t the same old salmon you’ve been making for years. Fresh parsley and tart lemon juice really bring out the best of the best when it comes to seafood flavors. Dare we say this recipe rivals those you’d experience at one of those fancy steakhouse restaurants? Yes, we do dare, and unlike those spendy, swanky restaurants, you won’t have to spend an arm and a leg on a dish that you can easily prepare from the comfort of your own kitchen. The recipe serves two people which is perfect for a fancy date-night at home, but it’s also easy enough to become a weeknight dinner on the regular. Big salmon fan? We have salmon recipes that are every bit as good as this one.